Jedediah McClure was born and raised in Indiana, in the heart of the Bible Belt where he spent his mischievous youth running wild in the country woodlands and playing pranks on the neighbors. He graduated from DePauw University with degrees in Economics and Political Science and pursued a career in business management where he became the youngest executive at MIT Financial before founding Affiliated Capital Investments, LLC. During his short life, he has traveled extensively throughout Latin American and has lived in both Argentina and Mexico. Jedediah has held a life-long passion for ancient history, especially with regards to the realms of religion and esoteria. He studied for four years in a seminary program and for nearly eight years taught classes on Christian principles and doctrines to all age groups. His interest in secret societies and esoteria led him to write and publish a college thesis exploring Yale's secret society of Skull and Bones and co-author the book "Fleshing Out Skull and Bones." He is an active member of his Christian community, introducing new and out-of-the-box methods for helping to make Christian teachings relevant to a new generation of truth-seekers. He has written many essays and articles on Christian culture and doctrines, including the yet unpublished works, "The Governing Dynamics of God" and "Adam: The Chosen One." He is also working on a new book, "Why Won't My Faith Move Mountains." Currently, he is a business executive and president of Affiliated Capital Investments. He is happily married to a wonderful woman who is the inspiration for everything he does and together they have three amazing children and a dog. Learn more about The Myths of Christianity Book or review Articles written by the author at www.MythsofChristianity. You may also contact the author at the email below, he would love to hear from you! Starting from the premise that there are two types of Christians – the ones that interpret the Bible literally and believe that everything within is true and the ones that read the Bible allegorically, being aware that the cultural context of the time can change the way we interpret it, Myths of Christianity by Jedediah McClure concentrates on the latter, offering a cultural background of the times when the Bible was written. The scope is not to demystify Christianity, but to open people’s minds. What is common knowledge for Biblical scholars is not for some Christians still preoccupied with their version of Christian truth, rejecting other sects and faiths. The author hopes to offer Christians a starting point in accepting differences, tolerating one another and finding the essence of this great religion which is love, generosity and charity. The book has three main parts, covering the existence of various Christian groups during the first and second century AD, and the development of the Bible as we know it today; the belief in God, angels and the Devil, and the cultural context of biblical texts. The author analyses many myths and mythologies that are similar to the stories in the Bible and offers an array of beliefs and folklore specific to those times. Myths of Christianity by Jedediah McClure is a challenging read on many levels. It can be read as an intellectual pursuit if you are passionate about mythology; as an eye opener for Christians without trying to dent their faith; as another point of view if you reject the scholastic approach to interpreting the Bible and so on. The chapters are well organized, well written and researched; the vocabulary is specific to this genre and specialized words are explained. At the end of each chapter, there are the notes that indicate thorough research. The scholastic explanations are intertwined with examples from the author’s personal life and beliefs, from current politics, economy and popular culture making the concepts easy to understand. I particularly enjoyed the reference to Plato’s allegory of the cave which was the starting point for the final conclusion of the book, as well as where Halloween, Christmas and Easter celebrations come from. 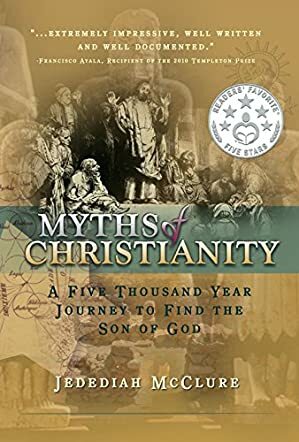 Myths of Christianity: A Five Thousand Year Journey To Find The Son of God by Jedediah McClure is not a criticism of the Christian religion; nothing could be farther from the truth. This book tries to put Jesus Christ and the men and women who followed Him and created a religion around His teachings in context with the other religions that existed or were known about at that time. This book is also not about a single sect or denomination of Christianity, it is a history of religion and how the Christian church evolved from ancient times to present day, how many other religions had an impact on the founders of Christianity and what is exclusive to Christianity and what is not. Using entertaining examples as diverse as Bruce Lee, Dante’s Inferno and McDonald's, Mr. McClure takes us through the development of angels, demons, gods and the holidays we celebrate today, sharing volumes of historical information in an easy-to-understand and interesting way. He shows us how miracles and magic were part of the lives of the people who lived in Biblical times, and how that impacted the men who authored the Bible. I recommend this book without hesitation to anyone who likes to know more about what they believe and how those beliefs have been shaped and reshaped over time. Christianity was not created in a vacuum. It shares elements of its makeup with many religions, those that no longer exist and those that are still practiced today. There are no new discoveries in this book, but I guarantee you will learn things about your religion that you never dreamed were true. Myths of Christianity by Jedediah McClure, takes you on a comprehensive historic journey into the Christian faith with the accuracy and detail of a college level text book, coupled with the personal accounts associated with a great autobiography. Mr. McClure’s scholarly background and detailed study are clearly apparent from the onset. However, this is done in such an intellectually attainable way, as to never distance or bore the reader. He covers in detail the origins of the most popular ideas surrounding religion, from angels & demons, heaven & hell, Easter & Christmas, to most importantly the origins of the doctrine itself. He offers a meticulous account of the religious history without taking sides, never trying to argue for or against a specific denomination in the Christian faith. This deliberately allows the reader to draw their own conclusions, with the comfortable knowledge that they have all the appropriate information to do so. I particularly liked the fact that Mr. McClure took the time to define religious nomenclature terms throughout the text, so as to not to break your reading stride. Stopping to Google unfamiliar terms can be exhaustive and disconcerting while enjoying a great book, often breaking your reading cadence. This subject matter is vast and complex by its very nature. However, this well organized work, allows the reader to digest the information in manageable portions. He explains things consistently well, often drawing parallels between modern day politics and pop culture. From famous martial artists, to infamous corporate giants, these analogies cement complex ideas for the general reader. The reality is this book as takeaways for everyone. The religious fundamentalist or extremist will benefit from the accuracy and unfiltered information, hopefully refocusing on the common themes throughout all faiths, which is love, connectedness, compassion, tolerance, etc. The everyday believer will enjoy the myths, stories and concrete knowledge surrounding the faith that they espouse to believe in. Even the Atheist will walk away with an increased historically knowledge, appreciating the hard facts without the emotional faith supporting interpretations that often taint religious literature. I enthusiastically recommend this work to anyone wanting an unbiased, comprehensive, and easily readable history into the Christian faith and its vast intricacies.